Wash and dry the onesies. 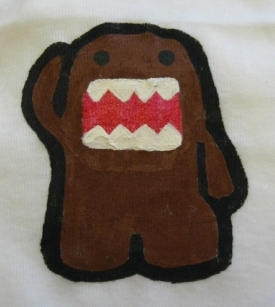 Look online for stencils you want to use to decorate the onesies and print them out. Make sure they're not too complicated or else your guests may not have enough time to let the paint dry if there are multiple colors involved. Cut out a piece of freezer paper that matches the size of the stencil. Place the stencil print-out under the freezer paper, and make sure the waxy side of the freezer paper is facing down and touching the paper. Use a Sharpie to trace the stencil on the freezer paper. Cut out the stencil outline on the freezer paper. Iron the freezer paper stencil onto a onesie (again, with the waxy side face down), using the appropriate heat setting for the onesie's fabric. 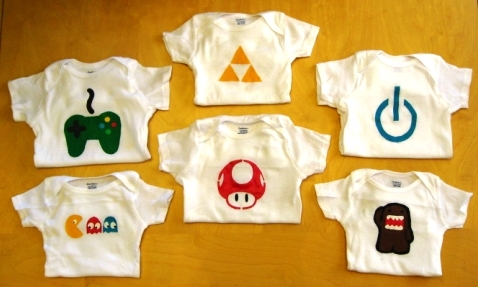 Cut out cardboard rectangles and insert them into the onesies under the stencils. The cardboard acts as both a solid surface and a barrier in case the paint leaks through. Cover your table with the disposable table covering and squeeze out the different colored paints into disposable plates/bowls. (Don't dilute the paint with water or else it may bleed under the stencil.) I had one paintbrush per color so people didn't have to rinse them out when switching colors. Also, if you don't have that many colors, people can mix paints to create new combinations. If your design requires layering of colors, wait ~15 minutes and carefully try painting on the second color, making sure it doesn't mix with first color. After an hour or so, it should be safe to peel off the freezer paper. The paint bottles will have instructions on how long to wait before you can wash the onesies. Soak the brushes in water to clean them. I'm surprised at how well they turned out! The lines are so clean and sharp... if you can believe it, a 3-year-old painted the Triforce and power button. Not everyone decided to use the premade stencils, so I have several personalized paintings as well. K has promised to make me a certain design that was too complex for stenciling, so hopefully I'll be able to show it to you someday. What's a favorite game you've played at a baby or bridal shower? omg how cool is that!!!! That is SO cute! I'll definitely have to try that, be a great baby geek gift!